This salad is an ideal starter at any time of the year as the ingredients are readily available. You could substitute the pears for apples, and the Stilton for any other soft cheese. 2. Core the pears and cut into thin slices. Brush with a little lemon juice to prevent it from browning. 4. Arrange the salad leaves on four small plates. 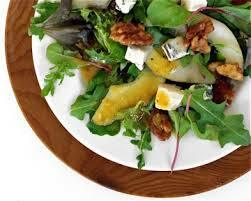 Pile on the pear slices, followed by the cubes of Stilton and finish off with a sprinkle of walnuts. 5. Spear the clove of garlic with a fork, and then use it to whisk together the oil, white wine vinegar, salt, pepper and sugar to make the salad dressing. 6. Drizzle the dressing over the individual salads and serve immediately. You can adjust the ingredients for the salad to make it healthier by reducing the amount of cheese used, or substituting a low fat cheese such as Feta. You could also increase the quantity of salad leaves and fruit.